By now we’ve all heard of the ‘amazing omegas’, those fantastic fatty acids that have all the scientists and supplement-makers squawking. We’ve been introduced to ‘good fats’ and lectured about the naughty ones and sold on all sorts of ‘superfoods’. And if one more person tries to tell me how healthy fish is, I may just do something very un-vegan! But truly, it’s a lot to try and make sense of. So I’ll do my best to lay it all out, in straightforward scientific terms. Here we go! There are certain nutrients the human body is unable to produce. These are termed ‘essential’, like the essential amino acids that make up proteins. The fatty acids that fall into this category are termed the essential fatty acids (EFAs). There are two main types of EFAs: omega-6 and omega-3. Both groups are required for normal bodily functioning and both groups must be obtained dietarily. These EFAs are used to regulate inflammation, adjust mood and behavior, affect cellular signaling, and more. They are also used as transcription factors that act on DNA. Omega-6s are unsaturated fatty acids, which means they are not bound to additional hydrogen (as opposed to saturated fats which are ‘heavy’ with hydrogens). They are critical for a variety of functions. Omega-6 deficiency may manifest as dry hair or hair loss, eczema, or slow-to-heal wounds. However, there can also be ‘too much of a good thing’. Very high levels of omega-6 are correlated to heart attack and stroke, arthritis and other inflammatory diseases, depression and other mood disorders, obesity, and cancer. Omega-3s are also unsaturated fatty acids. There are three primary forms: alpha-linoleic acid (ALA), eicosapentaenoic acid (EPA) and docosahexaenoic acid (DHA). All of these are polyunsaturated fatty acids (PUFAs), which means there is more than one point where hydrogen could bond (so essentially, very unsaturated). ALA is considered a short chain fatty acid, while EPA and DHA are both long chain fatty acids. These are EFAs and thus the body cannot produce them, though it can convert ALA into EPA and to a lesser extent DHA. Of all the essential fatty acids, EPA and DHA confer the greatest health benefits. Most scientists believe that the actual dosage of EFAs is less important than the ratio of omega-6 and omega-3. (4) This is because omega-6s (which can be detrimental in high doses) and omega-3s utilize the same enzymes for synthesis. It is thought that the ratio of LA (an omega-6) to ALA (an omega-3) is especially significant. The omega-6 will compete with the omega-3 for the same limited enzyme. The single enzyme can catalyze multiple reactions (not simultaneously), resulting in different types of eicosanoids (hormones), depending on the omega involved. In the case of excessive omega-6, the rate of synthesis is greater than the rate of metabolism (you are processing more Omega-6 than you are using), and the extra hormones produced could be dangerous. These additional hormones are sometimes referred to as ‘pro-inflammatory agents’. The omega-3s EPA and DHA, on the other hand, form anti-inflammatory molecules. The ideal ratio of omega-6 to omega-3 is somewhere in the neighborhood of 4:1, with 4 parts omega-6 to 1 part omega-3. Unfortunately, the standard American diet (SAD) typically includes a ratio closer to 10:1. The long chain omega-3 fatty acids are the ones that confer the greatest health benefits. Of these two, DHA is certainly the most ideal, though the virtues of both are identified in a number of studies. The short chain fatty acid, ALA, has not been shown to share these same healthful properties. Of course, EPA and DHA can be synthesized from ALA, but this is much less efficient than a direct source of EPA/DHA. In America there is no ‘recommended dietary allowance’ (RDA) for macronutrients, so Omega-3s, which are fats, do not have an RDA. There is an ‘acceptable intake’ (AI) of omega-3s, which is 1.6 grams per day for men and 1.1 grams/day for women. There is no current ‘upper tolerable limit’ (UL) for omega-3s. However the International Society for the Study of Fatty Acids and Lipids offers a recommended daily intake for omega-3s. They suggest 3 grams of ALA per day for men and 2.5 grams of ALA per day for women. They also recommend 500 milligrams of EPA/DHA per day. Coldwater oily fishes are the most popular source of these essential Omega-3s, which is why everyone seems so obsessed with fish and fish oil these days. But there are botanical (vegan, non-animal) sources of Omega-3s. Flax oil, sometimes called linseed oil, has a huge load of ALA – 55% composition – which is six time more than fish oil. Chia seed oil is similar in makeup. These two also have a good ratio of omega-6 to omega-3, which is equally as important. Flax and Chia have three times more omega-3 than omega-6. Other plant foods high in ALA include Butternuts (‘white walnuts’, not the squash), hempseeds and flaxseeds and chiaseeds, walnuts, pecans, hazelnuts, and acai fruit. But remember that ALA is not efficiently converted into EPA and DHA, and these are the fatty acids that are truly beneficial. For this reason it may not be enough to simply include ALA-rich food in one’s diet. For those that suspect they are low in omega-3′s, and especially growing children and those that are pregnant, breastfeeding, or immunocompromised, a direct EPA/DHA source is ideal. EPA can be found in brown algae (kelp) oil. The only non-animal source of DHA is microalgae, most notably the species Crypthecodinium cohnii and Schizochytrium. Algal DHA is just as bioavailable and just as effective as the DHA from fish. (19) After all, where do you think the fish get it?! Veg*n EPA/DHA supplements are widely available in health food stores and online. The essential fatty acids, omega-6 and omega-3, are required components of a healthy diet. Omega-6s are good, necessary even, but have negative affects when present in excess. There are three omega-3s, ALA, EPA, and DHA. EPA and DHA play a critical role in many areas related to health. ALA does not. ALA can be converted to EPA and DHA, but this is often inefficient. 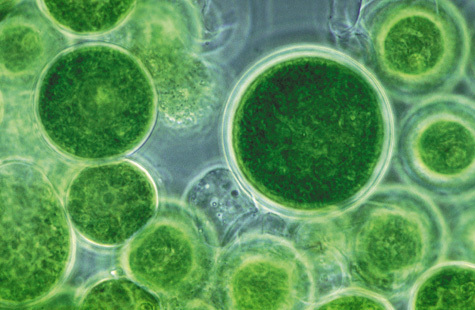 It’s better to take a direct source from microalgae. You do not need to eat fish or fish oil! First, I am so proud of myself that I understand all this. If I get enough scholarship money to attend Lewis & Clark, I’ll be a biology major in all likelihood and I’m so so so excited! Plus…it’s in PORTLAND! Second, thank you for taking the time and energy to write this all out. Now I have an easy and convenient way to explain why you really don’t need those fish oil pills. And besides….fish oil just sounds gross. Thank you so much for condensing all this down. I’ve read this before, but this is such a nice summary that I’m sending this link to my mom (a slightly-undernourished vegan). When I first “came out” as a veg*n to my mom, she was worried about my health so she gave me fish oil capsules and B12 gummies made with gelatin. I didn’t have the heart to tell her I would never touch them. @ Tenise Rae – Yes, I always hear about ‘fish burps’ – ewwww! DHA from algae will do the same exact thing to help lower your cholesterol. Good luck! @ April – Awesome! I used to put it in my green smoothies and oatmeal but I’ve fallen off on both of those lately. I want to try using flax oil in my custom salad dressings. As for sunscreen, yeah Australia must get pretty crazy! First I would say this is one of those cases where it’s too important to use it, so even if you can’t find the greenest, most natural stuff, make sure you’re putting it on when you’re working outside all day! As for specific natural brands I’m not really familiar with any, but the same old rules should apply – the ingredients list doesn’t need to be a mile long, look for natural and organic ingredients, companies that don’t test on animals are often also concerned with the environment, etc. @ Sandi Gulin – I take a prenatal, vitamin D, and DHA. Those are my baseline musts (multivitamin would replace the prenatal were I not pregnant, and I make sure it’s one with B12). I also take calcium right now and the occasional extra vitamin C + B-complex. I’d say you’re probably fine. You may want to add some D2 (make sure to get D2 because D3 is not vegan) during the winter depending on where you live and how much sun exposure you get. The flax is probably fine but actual DHA would be better if you can afford it. Yeah, it’s awesome that she’s vegan (she raised us vegetarian, btw), but she doesn’t eat a very healthy diet and has lost a lot of weight since going vegan. And our body type doesn’t have it to lose. I wish she’d eat some healthy fats and bulk up a bit (i.e. avocados, olive oils, etc). I too started looking at Omega-3 from algae, but the ones sold locally are at least double, if not triple, the price of fish oil capsules. Do you have any brand/online source you recommend? @ IngaG – I’ve used both Deva and NuTru. I don’t know how their prices compare to fish oil capsules, but it’s my opnion that with supplements . . . you get what you pay for! I’m definitely willing to pay a bit more to get a vegan, ethical, and quality product. I trust these brands to deliver what they promise, whereas I would be *very* skeptical about most cheap fish oils. thankz 4 that information.. now i know what to wright on my paper for the exam..thankz a lot.. Trying to keep up with all the information that comes my way is sometimes overwhelming, however I find all your info clear and concise…I have been talking Barleans Flax Seed oil forever but was recently told to switch to Udoʻs Oil DHA 3-6-9 Blend. It is twice the price of the Barleans but am giving it a shot. Any ideas on this?? I trust your judgement and read your blog incessantly. Every day I find something new to try and explore!!! Your Rock!!!! The point of these is that they provide omegas in the correct ratio . . . BUT, this is only appropriate if you are ingesting no other omegas! Since we are already getting dietary omegas, our ratio is already out of whack. Does that make sense? Further, we know that the ratio of 3:6 is very important, and that most people get way too much 6. So it just doesn’t make sense (to me) to add any more 6. What makes a lot more sense is to add as much 3 as possible, to try and get that 3:6 gap under control. At least that’s how I see it, and why the 3-6 and 3-6-9 supplements just dont make a whole lot of sense to me. I think so. Are you saying to stick to the Barleans and drop the Udos or to just take an Omega 3 supplement ? thanks for trying to help me out with this!!! Thanks so much!! I know you read this all the time but no harm in saying it again….YOU ARE AWESOME….. Thank you very much for your work, I (again) learned much from you. I just wanted to share my experience about D2. I was pretty low, so I started supplementing in a high dose. Then I checked my blood after 6 months of regular supplementation and my vitamin D was even lower by 25%. My alternative practitioner told me that several people have problems with using D2, so I ordered Vitashine (the vegan D3) now. I thought this could be interesting, but I bet you already heard of that. Next short point is selenium. Perhaps that could be interesting, too. But the chance of being low also depends on the country you are living in. I hope you get my point, my English isn´t very well. I really love your blog <3. Hey Sayward! This article is awesome. I put spirulina in my daily smoothie (you would not believe what goes into that smoothie: maca, goji berries, spirulina, flax seeds, nuts, coconut oil, and fruit and maple syrup to make it taste decent). Is a small spoon of spirulina enough microalgae to get my recommended does, or should I also supplement? I’m going to answer this on Facebook to make sure you see it, since I’m a bit late . . .
Have a looksee at these: still a bit more expensive but if you factor in the added vegan D3 and the savings on multiple purchases, it’s the best value non-fish DHA’s I’ve been able to find. Sayward, I know this is 5 years old but I just have to comment and say thank you. I just got done with a chiropractor appointment and he made my head spin talking about fatty acids and I left completely overwhelmed (and still having neck pain, lol!) I know he was well meaning but I just couldn’t translate all that info into my life and my diet. fortunately, I happen to know a scientist who specializes in breaking it down so a quick search of your archives brought me here. Now I feel empowered to make and educated choice. I know blogging is a weird animal and sometimes we all doubt why we put things out there, so I really wanted to tell you how helpful your words are. Thank you. Wow, thank you Violet! What a wonderful, heartening comment to get on such an old post. Seriously, it means so much to hear things like this – so thank you for taking the time to leave it!